Ukraine is a self governed state in South Eastern part of Europe. Ukraine has a population of approximately 44.5 million and it is the largest country in Europe with total area of approximately 603,700 sq km. The country has semi presidential system of constitution, a unitary republic nation. It is ranked 2nd in the strength of military power after Russia. Ukraine borders Russian Federation to the east and northeast, Belarus to the north-west, Poland and Slovakia to the west, Romania, Hungary and Moldova to the south-west, and the Black Sea and the Sea of Azov to the south and south-east, respectively. Ukraine's location is one of strategic importance at the crossroads between Europe and Asia. It's capital is Kiev. The most important river in Ukraine is the Dnipro (Dnieper), the third longest river in Europe. . Major cities of Ukraine are Kyiv (Kiev), Kharkiv, Odessa, Dnipropetrovsk, Donetsk. The country is home to 42.5 million people (excluding Crimea). 77.8% of whom are Ukrainians by ethnicity, followed by a sizeable minority of Russians (17.3%) as well as Romanians/Moldovans, Belarusians, Crimean Tatars, and Hungarians. Ukrainian is the official language of Ukraine; its alphabet is Cyrillic. The dominant religion in the country is Eastern Orthodoxy, which has strongly influenced Ukrainian architecture, literature and music. Ukraine has extensive, fertile farmlands, and it remains one of the world’s largest grain exporters. It is known as the global breadbasket of Europe. The developed and diversified economy of Ukraine includes a large heavy industry sector, particularly in industrial equipment and aerospace. Ukraine, today is well known for manufacturing all kinds of transport vehicles. It is especially renowned for launching newer and smarter satellites and its valueable contribution to space activities. Regional Importance Central Ukraine – It is a political, cultural, and economic centre of Ukraine. The capital Kyiv (Kiev) is located in this region only. Crimea and Sevastopol – It is a peninsula region which is a favorite beach outing spot for Ukrainians and Russians. It has mountains in the centre and beautiful beaches along the shore of Black Sea. The area is currently under dispute with Russia. The region being under control of many non Russian Countries before independence, there are strong presence of European architecture, religion, cuisine and language. This is a major coal mining and industrialized region, there are many big cities and home to ethnic Russian population. Region lies along the Black Sea Coast, is known for beautiful beaches. One major city of Ukraine the Odessa lies in this region. Ukraine has variety of geography; it is having mix of Highland, Low lands, Plateaus and Plains. Ukraine has a coastline along Black Sea and Sea of Azov of more than 2700 Kilometers. There are many rivers which flow through the country towards Black Sea. One the west side Ukraine has dense forests and is covered with it. Southern western part of Ukraine is having enormous mountains. Most part of Ukraine largely has grassland and is having highly fertile black soil. Carpathian Mountains are favourite spot of tourists for trekking and the best time is the month of May and October. Normally Ukraine has a moderate climate with warm summers and cold and snowy winters. Regions which are near seashore are subjected to warmer climates due to the moisture laded breeze from the sea. The temperature ranges from 5 degrees to 18 degrees majorly as we move from Northern to Southern part of the country. There too has a spell of short autumn and spring season and are more of mildly colder. Cost of living in Ukraine is comparatively very less as compared to other European countries and other countries in the West. There are many facilities available for students visiting Ukraine for higher education. Students are also given special discounts over transportation, foods in restaurants, sports and movie tickets. This makes over all expenses to be very less in Ukraine for international students. Moreover students are offered campus hostels by universities which further reduces the expenses to live. In monthly expenses as low as INR 5,000 to 10,000 students can live a comfortable life in Ukraine. There is special arrangements for Indian students; Indian students get Indian food in Ukraine University mess. 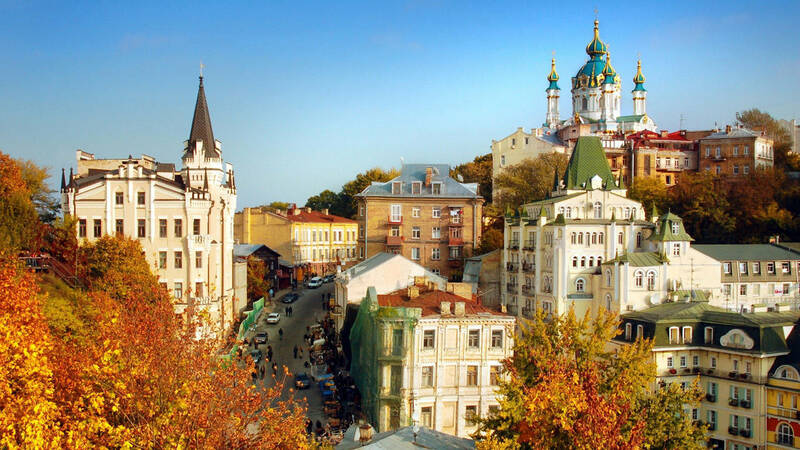 Ukraine is one of the most secure destinations for students or tourists to visit as there is no racial discrimination and hence foreigners may enjoy equal status in the country. Overall crime rate is very low. Ukraine is one of the favourite spot of tourism for European tourists. Majority of people from other European nations visit Ukraine as they provide high class European stay, with unmatched architecture, scenic beauty of dense forests, steppe, beaches and historical monuments. Ukraine has many famous dishes, some of them must be tried are Holubtsi, Potato Varenyky, Cabbage Borshch and Kotlety Po-Kyivskomy. Ukrainian culture is also very similar to Indian culture. Grandparents play an important role in upbringing and inculcating traditional and family values in the children. Most of the Ukrainians follow Orthodox Christainity and almost 60% of the citizens are not religious. To live contentedly while studying in any of the Ukraine Universities, the students will have to spend over 1400 USD every year for living costs. This cost is not included in the tuition fees of the applicants. In Ukraine, cost of living is comparatively cheaper than the other cities of Europe. But, no accurate figures can be given because the lifestyle depends upon the taste and demands of different students. So, the cost mentioned are approximately taken – Stationary – Students stationary stuff doesn’t costs much. For instance, a set of 1k rough sheets costs 2$. Other products such as pencils, pens, etc. are very cheap. Books – All content books are provided by the Library at University. Clothing – A branded and good quality Jeans will cost up to 15 USD, shirts will cost over 10 USD and T-Shirts will cost over 9 USD. Food – Food at Ukraine Universities is cheap for instance; for 1.5 USD the students can purchase 4 kilograms of potatoes, or 4 Kilogram Onions or 3l of milk, or other eatables, etc. The students can buy high quality milk products at reasonable prices.Travelling Within the City – The Travel Pass for Students via Public Transports like electronic buses, subway trains, etc. are issued by the Universities, itself. The pass costs only $5, per month. Travelling Around the Country – The applicants are offered with 40 % concessions on the normal rates of travelling tickets of buses, trains, etc. International Travel – International Travel Card for Students is provided as the students get admitted in any of the Ukraine Universities. The students owning the International Travel Card are offered with a concession of over 30 per cent from the prevailing rates of the flight tickets. Ukraine is a place where studying goes beyond the classrooms. Ukraine gives you a chance to enjoy intercultural life and learn from the best of the best and prosper as a globally demanded professional. Student life in Ukraine does not differ a lot from that in other European countries. Students study, meets new people, hang out, learn new things, travel around Europe, etc. Student Life in Ukraine is noticeably cheaper than life in other European Countries. Those who want to combine studying and exploring of the country with its culture and traditions may apply to universities in Ukraine. The cities like Kiev, Vinnitsa, Odessa etc are among the oldest in the country. Kiev is the capital of the capital of Ukraine. It is a center of economic, political and cultural development. Students who come to study in Ukraine and settle down have best job prospects among all. Ukraine is influenced by the Western European Culture and Lifestyle. Government of Ukraine gives a great deed of interest on providing number of facilities and affordable education to students in Ukraine, the benefits of the facilities are also being used by international students also who stay in Ukraine for study. From Pre-school to higher education all the facilities, course structure and performance are being monitored by the government. Ukraine education system are ranked at top positions among the European and other countries in the world. As per guidance of Ministry of Ukraine universities provide education to students in Russian, Ukrainian and English language also, this has resulted in increase in enrolment of international students. 172 state owned universities and 31 non state owned universities are present currently in the country which offers highly specialized education in almost every field. The facilities, course structure, basic amenities, faculty and administration are all monitored by Ministry of education and Science of Universities to provide a quality education to the students. More than 60,000 students reside and study at different parts of the country and are enrolled with different universities. They are given opportunity to choose from wide range of courses and specialties. MBBS in Ukraine has been a popular choice among Indian students as one of the most sought out destinations for studying MBBS in abroad. Medical education in Ukraine has become globally known for its Global recognition, affordable tuition fees and world-class education system. Some of the biggest advantages of studying MBBS in Ukraine is the focus on individual student’s learning and striking the right balance between theoretical and practical knowledge. The name of the degree a student gets after completing MBBS in Ukraine is MD Physician. This degree is equivalent to MBBS in India as per MCI. Recent years has seen a large number of Indian students opting to study MBBS in Ukraine and making a successful career for themselves. Ukraine has a great education system and infrastructure offering a plethora of opportunities for students, empowering them with superior level of MBBS education. At present, the country is enjoying enormous popularity among those looking to study MBBS in abroad. Ukraine’s highly efficient education and state-of-the-art system make studying MBBS in Ukraine a highly attractive prospect. MBBS course duration in Ukraine is 6 years including the internship in Ukraine. Most of the European countries have a course duration of 6 years. After this, the student can come to India and sit for the exit/screening test and do his or her internship in India. Once the student has started his/her studies in one university, the student will have to complete their education in that university only, transfer is not allowed by Medical Council of India.